One of the smarter lifestyle choices that I have made is to be a non-smoker. Both of my parents smoked when I was younger, and I always hated the smell of burning cigarettes. Cigarette smoke still makes me sneeze, even today. Smoking was a contributing factor to my father's early death from throat cancer, so I am glad that I had a natural aversion to the habit. When I was a teenager, I had a part-time job at the local corner store, and being the general dogsbody, I was responsible for keeping the shelves stacked with everything from apples to zinc cream. I always loved stacking the tobacco shelf. Roll-your-own cigarette smokers and pipe smokers were fairly common in the sixties, and tobacco used to arrive at the shop in cartons containing pouches of Champion Ready-Rubbed and Drum tobacco for "rollies", and tins of Amphora and Dr Pat for the pipes. Raw (I guess it wasn't really raw - it just didn't have all that other junk that they put in cigarettes!) tobacco had a seductive smell that was almost overpowering on opening the cartons that they were transported in. At that time, i didn't think too much about where the tobacco came from. I assumed that it originated overseas, although I did know that cigarette manufacturer WD & HO Wills had a large plant over on the southside of town in the suburb now known as Robertson. 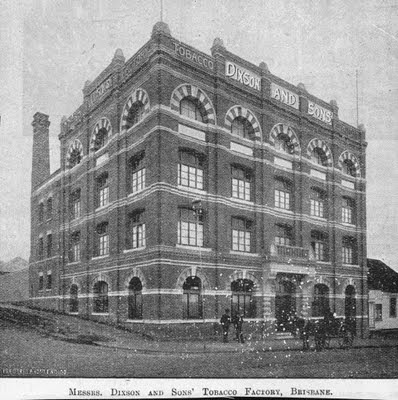 But tobacco was grown in Australia (mainly in North Queensland), and there had been a tobacco factory right here in Brisbane - the Dixson and Sons multi-storey building in Fortitude Valley, pictured below in 1896. Sensibilities about smoking aside, it was felt that there was a financial incentive in having this business in Brisbane. Click here to read an excerpt from "The Queenslander" newspaper of 21 July 1896 that discusses the commercial benefits to the city and also gives the reader a tour of the factory and a description of the manufacturing process. The old Dixson's building survives, on the busy corner of Brunswick and Ivory Streets in the Valley. The exterior has changed somewhat, as you can see in my recent photo (above - click for a larger image), that I have chosen to present in black and white. In 1901, Dixson's joined with WD & HO Wills to form British Tobacco Co. (Australia). I cannot say when tobacco production ceased in the building, but it is now home to a contemporary design house. Next: Call me a cab!